Since 1888, eye protection is at the heart of our expertise. 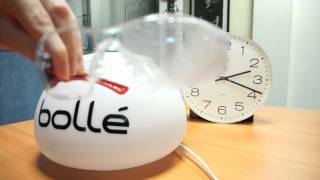 Bollé Safety, a world leader, designs, produces and markets safety spectacles, goggles and face shields for the rail industry. Bollé Safety provides an effective and innovative response to each risk. Industry, manufacturing, construction, aeronautics or the military, Bollé Safety caters to all markets and constantly improves its models with technological and ergonomic solutions to satisfy users daily. At Bollé Safety, we are constantly innovating to bring to each specific trade, effective protection solutions that are pleasant to wear. Always bearing in mind that the best protection are those that make you want to wear them, Bollé Safety is developing complete product lines that are tailored to the needs of its rail industry users. It is our shared commitment to providing the highest quality protection for our users which is why the Bollé brand is a strong brand. Bollé Safety has been pursuing the same single objective for more than a hundred years: to detect all possible work environment risks and provide tangible technological solutions and specifically targeted treatments, that comply with the most stringent European Standards. 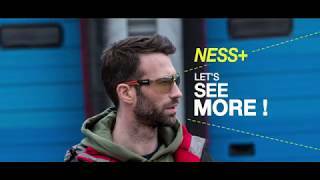 Ultra-innovative, materials, lenses and accessories of the all Bollé Safety ranges have a simple goal: to provide maximum comfort to users with design and performance. Bollé Safety, a world leader in the design and manufacture of protective eyewear, has a wide range of safety goggles for the rail industry. The new indirect vented Pilot with Platinum permanent double sided anti-scratch and anti-fog coating ensures that the lens will not fog up any extreme conditions. It has been tested and approved to EN 166 1BT KN 3, 4, 9 and EN 170 2C-1.2 (clear) and EN 172 5-3.1 (Smoke) and EN 172 5-1.4 (CSP). 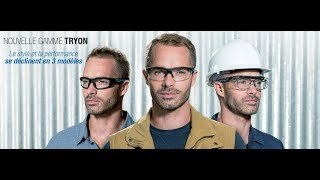 Available in three lens options, clear, smoke and CSP, the new Pilot is an extremely versatile, low profile goggle that has been tested and approved to meet the highest levels of impact protection, EN 166 1BT KN, and also provides the wearer with protection against chemicals, dust and molten metal. All lens versions of the new Pilot are supplied with Platinum permanent double sided anti-scratch and anti-fog optical class one polycarbonate lens with a wide adjustable strap for extra comfort. The Pilot has a toric lens for improved field of view but will also fit comfortably over prescription spectacles. Bollé Safety has developed the Silium+ to provide the rail workers with the highest levels of protection, style and comfort and at the same time offering the rail industry exceptional value for money. 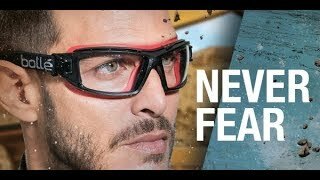 The Silium+ weighs in at an incredible lightweight 21g, making it one of the lightest safety eye shields ever made, which is due to Bollé’s use of advanced material technology combined with their design and manufacturing expertise. The Bollé design team have also made sure that the style appeals to everyone and provides all wearers with market leading levels of fit, comfort and protection. Although the Silium+ is extremely lightweight it is fully approved to the highest European safety standards and also incorporates the unique Bollé Platinum lens expertise guaranteeing class 1 optical performance and quality. The lens design ensures an exceptional field of view of over 180º combined with integrated side shields and the high performance Platinum double sided anti-scratch and anti-fog coating as standard. The Silium+ is also supplied with a free microfibre pouch that not only protects the lenses but can also be used to clean the lenses. 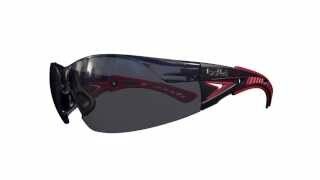 The Rush+ from Bollé Safety is the epitome of safety, style, protection and performance. Ultra-enveloping and without any visual interference the Rush+ from Bollé Safety provides the wearer with a 180° panoramic visual field with perfect optical class one Platinum double sided anti-scratch and anti-fog polycarbonate lenses. The Rush+ has a wide range of lens options – clear, smoke, CSP and Twilight and is also available in a small size. New to the range is the unique and revolutionary Rush+ Glow with its Phosphorescent temples which glow in the dark for a minimum of 5 hours when exposed to only 5 minutes of light. 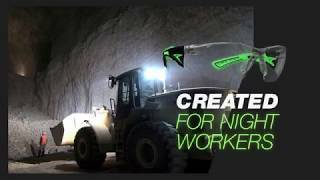 The new Rush+ Glow allows the wearer to be seen in the dark keeping them safe during night time rail working. 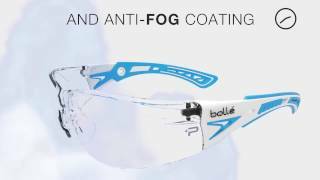 Bollé Safety, a world leader in the design and manufacture of protective eyewear, have developed Contour Rx for the rail industry combining the world’s first base 8 prescription wrap around safety eye shield with Platinum anti-fog and anti-scratch FreeForm Digital HD safety lens technology. 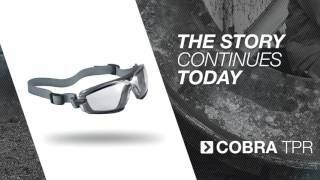 Based on the market leading Contour eye shield, the prescription version gives the wearer sports styling combined with safety and protection and still meets the highest European Standard EN 1661F. All this without the complication and distractions of an insert. A truly unique product. Combined with the newest pioneering lens technology, Free Form, which uses one single point diamond to customise both lenses to each individual prescription. The diamond strikes the lens 40,000 times, re-calculating every 0.01mm using CAD technology, thus creating a higher definition with a much improved peripheral vision, providing superior levels of protection for rail safety. Especially designed for the rail industry, the Sphere is a lightweight, close fitting fully adjustable face shield with an excellent field of view and meets the highest levels of impact protection. The Sphere is tested and approved to EN 166 1A 3,8,9 and also provides protection against short circuit electric arc. 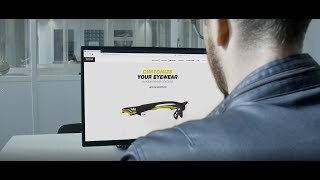 Bollé Safety revolutionizes eye protection with an innovation that exceeds the requirements of all international standards, especially EN166 K and N option. It also guarantees greater safety, reliability and comfort. 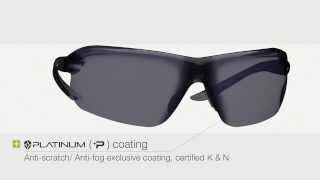 This permanent coating on both sides of the lens gives them a high resistance to scratching to the most aggressive chemicals and delays the onset of fogging (K (anti-scratch) and N (anti-fog). In all circumstances and at all times the Platinum lens innovation guarantees rail workers eyes improved protection. B-Clean by Bollé Safety is a complete and efficient cleaning solutions range that have especially developed for cleaning and protecting all Bolle Safety lenses. Alcohol and silicone free, its water based formula guarantees perfect cleaning and protection for your glasses and goggles. B-clean products are certified by COLTS laboratory. Bollé Safety has developed a range of low profile, high impact protection safety goggle for the rail industry, including the new Baxter, Cobra and Tracker. The Baxter has been tested and approved to meet the highest levels of impact protection EN 166 1BT 345 KN and also provides the wearer with protection against chemicals, dust and gas. Available in Platinum double sided anti-scratch and anti-fog polycarbonate clear, smoke and CSP versions the Baxter has a unique removable/adjustable strap and waterproof foam seal for extra comfort and protection. It is also available as a prescription option. Bolle Safety, a specialist safety eyewear manufacture to the rail industry and developed a range of electronic welding helmets for the rail industry including the Fusion+, Flash and Volt. The Volt is a very cost effective and lightweight welding helmet that is suitable for welding MIG / MAG, TIG and Grinding, VOLT is the ideal compromise between safety, protection and comfort. Available with a variable auto-darkening shade filter and a comfortable 5 position headband, VOLT meets all the requirements of a powerful and multipurpose welding protection. A revolutionary new lens coating that provides 100% protection against UVA and UVB rays and blue light. This innovative coating is an effective solution for all activities that alternate exposure to bright light and low light, while also being suitable for extreme hot and cold temperature environments. CSP is also combined with the exclusive PLATINUM double sided anti-scratch and anti-fog coating that sustainably combats fogging. The new Twilight technology offers the advantages of ESP but with Platinum double anti-fog coating (on both sides of the lenses) to prevent fogging in the most challenging conditions and it’s also anti-scratch. Designed and used in low light conditions, it improves contrast. Its light transmission rate is perfect for indoors or outdoors, particularly early morning and late evening. Twilight filters 76% of blue light. A revolutionary new lens coating that provides 100% protection against UVA and UVB rays, filters out over 70% of blue light (380nm to 500nm) but still transmits over 60% of visible light. This new lens should be provided to all outside rail workers to improve their level of protection and comfort. A unique lens that combines two coatings, a Hi-Definition multi anti-reflective and a water resistant Hydrophobic. The Hi-Definition increases the amount of visible light passing through the lens and therefore improves definition while the Hydrophobic coatings repels water and liquids improving clarity and vision. The perfect lens for anyone working in dimly lit areas or working outside in inclement weather. Co-Branding: Customize Your Eyewear in Your Brand Colours!